Some home improvement projects may not add much or any value to your home, though others may add significantly to the value. Which home improvements should you consider, and which improvements should be avoided? We suggest adding a deck, vinyl siding, window replacement, paint and a kitchen remodel. The least expensive thing you can do to improve your home is to paint. Freshly painted rooms have a clean and updated look. If you are looking at resale value, choose neutral paint colors. Paint allows your home to look its best while protecting it from wear and tear. The addition of a deck should increase the value of your home. This is one of the first improvements many home buyers make, so you will make your home more enjoyable with an outdoor living space, and it should have increased appeal to buyers. HGTV reports that homeowners may be able to recoup 65-percent to 90-percent of this investment. By replacing vinyl siding, you may recoup as much as 80-percent of the cost when you sell your home. New siding helps make your home look new. Vinyl has low maintenance costs. You may recoup as much as 77-percent of the cost of window replacement. You should increase the efficiency of your home and make it more appealing with new windows. Most people regard the kitchen as the heart of the home. The kitchen is one of the most important rooms evaluated by prospective buyers. According to HGTV, homeowners can expect to recoup 60-percent to over 100-percent of their investment in a kitchen remodel. Painting the kitchen is a first step. Vinyl flooring tends to cause your kitchen to look dated. Consider replacing vinyl flooring in the kitchen with laminate or tile. 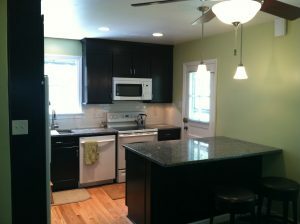 New cabinets, a new sink, updated lighting and new countertops will all add value.